Dhaka, Sep 5 (Just News): BNP today announced a two-day countrywide programme demanding freedom of its Chairperson Begum Khaleda Zia. The programme includes holding of an hour-long human chain on September 8 and a two-hour-long token hunger strike September 12. 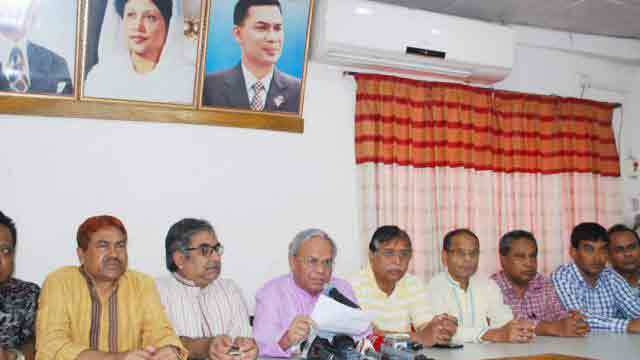 BNP’s senior Joint Secretary General Ruhul Kabir Rizvi announced the schedule at a press briefing at party’s Nayapaltan central office. He said BNP leaders and activists will form human chains in all metropolitan cities and district towns from 11 am to 12pm on Saturday (Sep 8). In Dhaka, Rizvi said, the human chain programme will be held at Jatiya Press Club. Besides, he said, the party will observe a token hunger strike in all metropolitan cities and all district headquarters from 10:00am 12noon on September 12. The BNP leader also said they have sought permission from authorities of Mohanagar Natiya Moncho and the Institution of Engineers, Bangladesh, as venue for their token hunger strike.